We can’t believe its NOTES time already! 2016 marks the 11th season of the Elgin Youth Symphony Orchestra NOTES campaign and is the Childs family’s 6th season of participation. This year NOTES runs from January 17 through April 10, 2016. We ask you each season to give to EYSO not only because we believe in the work our organization does but also because it makes such a difference in our lives day to day. This is my sixth year playing with the EYSO, my second year playing violin with the Youth Symphony and my first year playing in the Hanson String Quartet (HSQ), one of the Chamber Music Institute’s (CMI) Honors Chamber Ensembles. As a member of HSQ I have had the opportunity to represent EYSO in our community and demonstrate the value that chamber music brings to the making of a student musician. In Youth Symphony we’re preparing Mahler’s First Symphony, The Titan, which is super hard and really exciting. I’m playing first violin for the first time in Youth Symphony (last season I was a second). It’s good to have a wide range of experiences; sitting in both sections allows me to appreciate all of the value of both parts and how they each contribute in their own way to the over all success of the orchestra. A highlight of the season so far was accompanying Rachel Barton Pine when she performed the Sibelius Violin Concerto at our November concert: Monumental. Accompanying an internationally-recognized violinist was such a great experience, as we not only had the opportunity to play with her but also learn from her about what it’s like to play such a challenging piece. I played with the IMEC Honors Allstate Orchestra last month. It was a blast. Check out the video of the entire Pines of Rome here and the last movement above in the Featured Videos area. On February 28 I performed the Mendelssohn Violin Concerto in E minor at my teacher, Mrs. Starrett's studio recital. The video is posted above. I hope you enjoy it, I am proud of my performance. This is my fourth year playing cello in the EYSO, and my second year in the Philharmonia orchestra. I was very excited to learn that I was one of two winners of the Philharmonia Young Artists Concerto Competition, and that I will play the Lalo Cello Concerto in d minor at our March 13, 2016, 4:30pm concert. This season, I got to meet one of my cello heroes, Lynn Harrell at the Elgin Symphony Orchestra's open rehearsal before his concert with them. He was very gracious and exacting. My Chamber Music Institute group this year is playing the Schubert Quintet for Two Cellos in C major, and I have really enjoyed that experience of playing with another excellent cellist in my ensemble. My favorite piece besides the Lalo that we have practiced this concert cycle so far is the Poet and The Peasant Overture by Franz Suppe that will be conducted by guest conductor Daniel Boico during the March concert. Playing in the EYSO for the past four years has definitely helped me grow as a musician, and as a person. I am looking forward to the rest of this 40th season of EYSO, and the many years of opportunity for me in the EYSO to come. This is my third year playing the viola in EYSO, and my first year in the Philharmonia Orchestra and in the Chamber Music Institute. This is the first season that Trudie and I are in the same orchestra at EYSO. My experience so far in the EYSO has made me a better musician, a better collaborator, and overall a deeper thinker about the music I play. I enjoed leading my section in the Philharmonia Chamber Orchestra, as we played Variations on a Shaker Melody From Copland’s “Appalachian Spring” and Haydn’s “The Clock.” I am also having the experience of carrying my part in my CMI group, The Wolfgang, as we recently played Mozart’s Quartet No. 2 in D Major. In the Philharmonia Orchestra I am having the greatest opportunity as I am accompanying the concerto competition winner, my twin, Trudie on the Lalo Cello Concerto. Overall, my experience with the EYSO has been very fulfilling in the sense of accomplishing something with my instrument, playing with an orchestra full of so many people that are dedicated to their instruments, and having the opportunity to discover new pieces and learn new things. In addition to school orchestra and EYSO, both Trudie and I were honored to lead our sections on a very snowy concert day last November at the ILMEA District 9 Junior Orchestra Festival. I also performed in Mrs. Starrett's studio recital on February 28 playing an unaccompanied Telemann Fantasia. I had the fantastic opportunity to perform it just the day before for Elgin Symphony Orchestra Principal violist, Matt Mantell at a masterclass. He gave me lots of feedback, and I feel I played well at the recital. I hope you enjoy the video. I continue to serve as the Communications Director for the EYSO. Each week, as I send out the eNews, prepare press releases, marketing materials and provide support for our artistic staff during Sunday rehearsals I see first hand the effects of your NOTES donations at work. In addition, Stella, Trudie and Storey benefit from their their experience as valued members of a fair and encouraging creative environment. As a family, we are honored to support an organization that has a national reputation for providing not only an engaging musical experience for its students, but also a comprehensive learning environment which values curiosity, imagination, critical thinking, and collaboration over competition. If you work for a company that has a matching gifts program, please ask them to match your donation. Upon completion of the NOTES 2016 Campaign you will receive a donation acknowledgement statement from EYSO for tax purposes. No magazine subscriptions, wrapping paper or tins of popcorn – only spectacular music education and great performances! Thank you in advance for your support of the EYSO! We will be happy to take donations online via the button at the top of the page, in person, or please mail them to the address below with a donor pledge form, downloadable here. Please make checks payable to EYSO. P.S. 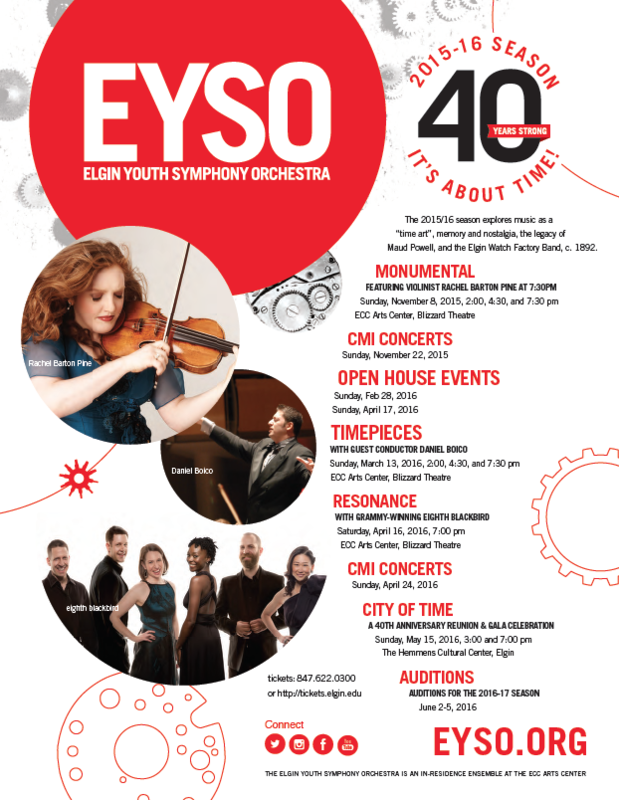 visit www.EYSO.org for our upcoming concert dates – come and hear us perform! Stella playing Pines of Rome (last movement) with 2016 IMEC Allstate Honors Orchestra in Peoria, IL.